Bangalore is a cosmopolitan hub that houses a number of modern attractions to attract people to it. 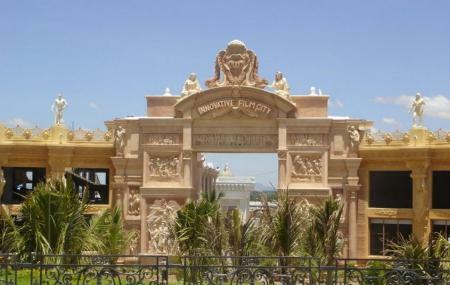 Spread over 50 acres of land, the Innovative Film City in Bangalore is an entertainment venue that pulls people owing to its world class facilities. The film city houses 27 different facilities including amphitheater, food courts, retail high street, theme restaurants, haunted mansion, Cartoon City with India's biggest roller coaster, entertainment district with India's first dinosaur park, Aqua Kingdom, Ripley's Believe it or Not Museum, Miniature city, Ripley's Enchanted Mirror Maze and many more. Do visit this attraction with your kids! For added attractions prices refer official website. How popular is Innovative Film City? People normally club together Parshwanath Sushil Dham and Dwadasha Jyotirlinga while planning their visit to Innovative Film City. I liked the place. You can take some nice clicks here. The only problem is they r not maintaing the place, which made me disappointed. If they would maintain it would be a great tourist attraction. The entry fee is ₹750, So, as per the entry fee, they should maintain the place. There r. Many things to see inside and it's a good place to spend a day. Kids will enjoy a lot here. Nice place for half day trip. Opens at 10 am. Better have breakfast at bidadi and reach this place. Not crowded at all and there are ample activities to keep you engaged. When I visited in March 19, beach, Haunted mansion and Water park were closed for renovation. You can buy the lunch while buying the ticket itself and is cost effective in the combo. Amazing place to spend time with family and friends. Its a bit far from the city so try to reach early so that you can enjoy all the attractions. Entry is around 450-500rs. Its super fun. Average place. The big boss room was the best attraction. Most of the places were either shut down for renovation or badly maintained. All the stalls including food stalls accept only cash and there is no ATM inside the campus. The water park seems a good place to spend most of your time. Not worth the long distance but could serve as a time filler for around 3-4 hours. The total wastage of money & time. As compared to entry fee inside nothing is there. Only big boss room is attractive point except nothing is there full of disappointment. Even our local BBMP parks are far better than this film city.